And I always wanted some of the Forestmen. I think I had one Forestman because he was captured in one of my sets. Reposting from the tshirt thread: This is now my favorite tshirt I own. Now that I own a house with storage space my parents are cleaning out their basement and gave me my old lego sets. Including the one pictured above. Tsk, tsk, tsk. Don't hate. Most of my time was spent making my own stuff. I mean, they're Legos, you can do anything with em. And I had plenty of the nondescript colored blocks and big green "grass" sheets (I don't know what to call them, base like you said makes sense). Galaxy Explorer for the win. I have the Classic Space logo on my helmet for moped riding. The Blacktron series holds a special place in my heart, particularly this set. The Wolfpack guys were really cool. I had the Wolfpack renegade set, and maybe one other guy who had been captured by the dragon knights? I don't remember. Ah, yes. Dragon Master. The Dragon Master sets were amazing. I loved their shields and awesome flip-up helmets. EDIT: Oh sh*t! There's my captured wolf guy right in the picture. That's awesome. That is a wicked shirt. I wonder if that guy would make one with the Wolf Logo. Legos were my go-to toy growing up! My favorites were the classic space series from the late 70's, early 80's (Galaxy Explorer, Alpha-1 Rocket Base, Beta-1 Command base). One Christmas, I remember wishing for every space set in the catalog. Around 1998, I dug out all my old Lego and started collecting Classis Space on eBay and ended up with every set between 1978 and 1984, only to sell them all a couple of years ago. It seems food and shelter are more important than old Lego sets! This has to be one of my favorite sets from modern times: http://creator.lego.com/en-us//Produ.... I dare not buy it because I'll end up with the whole Creator series. I tend to have the "Gotta catch em all" disease when it comes to this stuff. For some really amazing user created stuff, go here: http://mocpages.com/. I started with Legos back when the people had no faces, no arms and no real legs. I had a bunch of civic sets -- a police station, a fire station, a home, things like that. My first Expert Builder set was the go cart (pictured earlier in this thread). My second Expert set -- and favorite all-time Lego set -- was the car chassis. I would build it, roll it down the steps and rebuild it. I actually managed to break one of the long red pieces. For two or three summers, my friend Richie and I spent the summers up at church while our moms rewrote the Sunday School curriculum. We had free run of the place, including the supersized Fellowship Hall. Our daily challenge was to build cars that would not only go fast (and straight) but not to break when we threw them against the wall. Looking through this thread, I'm shocked by how many of these sets I had. I have the majority of my Legos in a trunk at my mom's place, waiting for when my son is old enough to play with them. Every time I walk past the Lego section in Target, I get an urge to buy a set. I'm sad that so many of them, now, are just licensed products. I get that urge too, and that same sadness. Not just that they're licensed products, but the sets are these days just a handful of custom pieces built specifically for that particular licensed thing. Actually, I kind of recommend going, if you end up scraping together the money some time. I wasn't exactly a fresh sprout when I went, either. My experience was that it was very cool. They had some rides type stuff, but mostly a variety of displays you could walk around and look at. One bit that sticks in my mind was a very large Lego New Orleans, where one of the things in it was a cop frisking a perp in a back alley. In addition to stuff like that (Lego sets writ large), you had some cool monumental Lego constructions, and I think I recall at least one play area for building a technic robot sort of thing and fiddling with it. Then at the end, you go into the Lego store and they extract your soul. Everybody in at least their mid-20s was clearly totally enjoying themselves, with this sort of "Ooo. Wow!" nostalgia glow about them. Anybody under 15 was totally bored out of their mind, and had clearly been dragged along by their folks. It's possible things have changed since I was there, of course. I feel like Lego sets are now more like action figures that you have to construct yourself than sets of bits to build new things with. But hey, I've got some money, so I just might go get myself a set this weekend. We've got one just up the road in Windsor, and my wife (also Lego fan) and I talked about it last night after looking at this thread. I sense a visit might be on the horizon. I bought my niece her first Lego set this last Christmas, and I was happy to find out that they're apparently moving back towards a more "generic" mind-set. The sets I looked at tended to be less "special purpose" pieces and more "generic" pieces as their recommended age level increased. So that the ones for younger kids are easier to build, but the later ones require a bit more thinking to put together "as is", and also allow for more creativity in doing other stuff with the blocks. I got to go to Legoland Windsor when I was 6 and in England for a wedding with my family. It was awesome. I lost the drivers license they gave you for completing the bumper car course, but it rocked. Thanks for finding it so I didn't have to search. 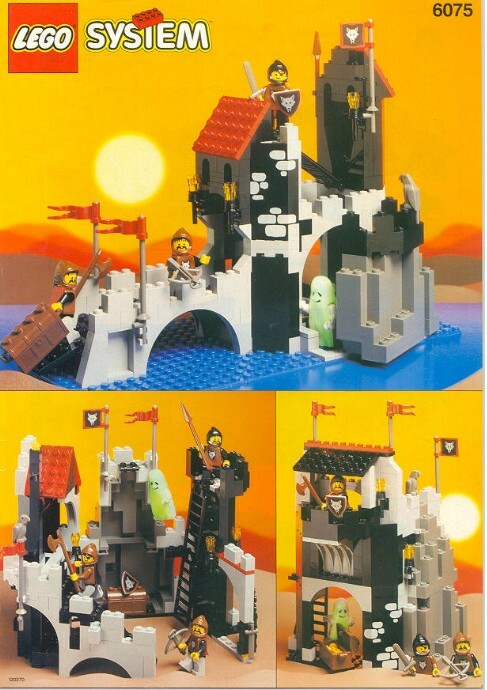 That's the one Pirate set I know I had as a kid. Most of my other LEGOs were mixed parts from single vehicle sets or something. There was a while there where I combined some into some type of helicopter-ish vehicle for my late 80s GI Joe figures as well. Sure they didn't exactly fit quite right, but I made the fiction work in my head. Some type of experimental prototype vehicle thingy. Forget nostalgia, I keep some legos on my desk and mess with them during loading screens and when I'm watching video. Every month or so I swap them out for other legos in my collection. Taking my legos to college was the best idea I've ever had. I'm actually getting kind of excited to try out Lego Universe. I wish I had got in on the beta. If I can go in to the world and build all of the old sets I had somehow... it is going to scratch that nostalgia itch just right. I'd want one with the lion or hawk (or whatever that bird is). I think it's a griffin. 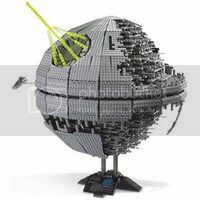 For many, many years LEGO stuck with no licensing and making everything generic so every set would work with every set. They turned down numerous licensing deals brought to them. LEGO was facing slumping sales when they took on licensing of Star Wars which made their sales explode more than they had in 20+ years. Now there's a lot of licensed product LEGOs, they sell. The lion one doesn't have wings and the bird one doesn't have a lion's head. Definitely not a griffin. I loved the Galaxy Explorer, but one Christmas I found the Cosmic Fleet Voyager waiting under the tree, and it was my favorite set for at least a year. I can't even count how many times I built, destroyed and rebuilt that set. I agree on this, but it is a little disappointing to find that there are no alternate models shown in the Toy Story sets, on the box or in the manual, to help inspire someone to build something of their own creation. I have to wonder if that is part of the agreement they have with the license holders. The generic sets for younger kids are fantastic, however, with several alternate models, and fewer "specialty" pieces, with an emphasis on easy building. I think my head just exploded from the wave of nostalgia. I had that. I loved that. Well, I put it together once, took it apart, and built little spaceships with its component parts for years and years to come. Now I have kids old enough to occasionally love Legos when they aren't whining to play Wii or DS. I'm still the one who puts the sets together, though. I keep threatening my wife that I'll buy the $400 Millenium Falcon set. If it only wasn't about three feet long . . .
Ok, so this one isn't nostalgic since it's fairly new, but I really, really want this set! This thread makes me sad that my mom gave all my old LEGO sets away. Wow. This makes me want to take my Legos out of their closet of safety to play with them again. My house is actually still littered with a lot of the Collectors sets. I have the Space Shuttle, the Wright Flyer, and used to have the original Millenium Falcon... But it suffered a tragic death when it fell off our piano during an earthquake.